Performance evaluation in running – Part 3: Energy expenditure during running. This is the third part (the first was about VO2max, while the second was about the energy expenditure during rest) of a journey into the evaluation of the runner’s performance, made possible with the big support of Mark Henninger (himaxx Centre for Altitude Training – Berlin, Germany), that provided the ergospirometer, the treadmill, the hypoxic chamber and his knowledge for the tests. Thanks Mark! In terms of total energy expenditure is it more expensive running a 10 km race at 10 km/h or at 20 km/h? If we don’t consider the air friction component and if the race is run without any pace variation (steady state), the answer is: the total energy requirement is approximately the same! The reason lies in the linear relationship between oxygen consumption and running speed. As a rule of thumb, during horizontal running the energy cost is about 1 kCal/kg/km. 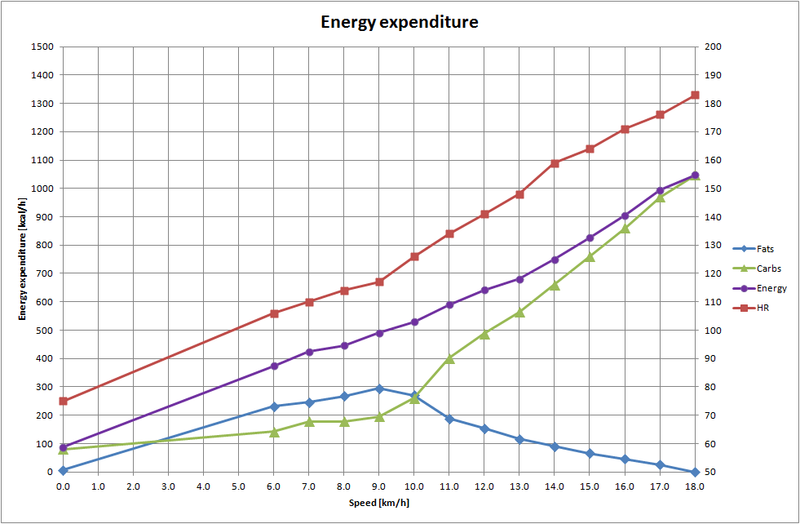 Thus, the energy cost of running 10 km for a 70 kg individual averages 700 kCal, regardless of running speed. Proteins contribution is not taken into account, as explained in Part 2. Figure 1 – Energy expenditure during running. We are working on the fourth part, wich will be published after the next test session. Meanwhile…keep on training, people! Performance evaluation in running – Part 2: Carbs, Fats and Proteins as Energy for living. This is the second part (the first was about VO2max) of a journey into the evaluation of the runner’s performance, made possible with the big support of Mark Henninger (himaxx Centre for Altitude Training – Berlin, Germany), that provided the ergospirometer, the treadmill, the hypoxic chamber and his knowledge for the tests. Thanks Mark! During exercise the whole-body energy requirement increases 20 to 30 times above resting levels, but what are the relative contribution of Carbohydrates, Lipids and Proteins in the different energy transfer systems? physical activity accounts for the remaining 15 to 30%. The first part of the ergospirometry is exactly the measurement of the RMR: without taking into account the Proteins’ contribution (being far enough from the last meal and without doing any prior physical activity allow this approximation), the machine can split the energy expenditure between Carbohydrates and Lipids measuring ventilation and oxygen and carbon dioxide concentration of the inhaled and exhaled air. There are some generalized equations to predict the Resting Daily Energy Expenditure (if anyone is interested, please contact me and I will write something more specific), but the direct measurement is always the most accurate solution. As an example, in the Table presented below a set of typical data resulting from the RMR analysis with the ergospirometer is shown. Table 1 – RMR analysis data. The third part will be about the energy expenditure during exercise. Meanwhile…keep on training, people!